Upholstery is either made of leather, natural fibers, synthetic fibers or a combination of each. Upholstery is usually a little more delicate than carpeting and therefore needs to be handled a little differently. Bulldog Cleaning & Restoration Technicians determine the most appropriate way to clean your upholstery and use a various array of specialized tools and chemicals to complete the task. Our IICRC Certified Technicians have the experience and knowledge to successfully remove most spots and stains and can deodorize most fabrics and furniture. We also offer Flourochemical Treatment options post cleaning to help protect your favorite pieces! Natural fibers such as wool, silk and jute are contained with many carpets and upholstery. Carpet and upholstery made from natural fibers tend to be more delicate than their "synthetic" counterparts. They also tend to be more expensive. Therefore, natural carpeting is not as commonly found in commercial spaces as they are in residential. A lot of the "real" area and oriental rugs contain natural fibers. Bulldog Cleaning & Restoration Technicians utilize fiber specific chemical pre-spray and spot treatments to ensure the fibers/fabric are not damaged during cleaning. Most synthetic carpeting comes with a factory applied flourochemical treatment. This helps to prevent spots and stains during install and the first year or so of use. Flourochemical works by filling in the empty space in the fibers left over from the coloring process. The flourochemical prevents external liquids and soils from entering and dying the fibers. This allows the cleaner to remove soils, stains and spots a lot easier than otherwise. Synthetic fibers are found in most residential and commercial carpeting and upholstery. Nylon and polyester are the two most common synthetic fibers found during carpet cleaning. They are usually pre-treated with a factory flourochemical (ScotchGuard) that helps prevent spots and stains during install and the first year or so post-install. Generally the flourochemical wears off over time due to use and traffic. Synthetic carpeting and upholstery can usually be cleaned with 90% of the chemical(s) out there. There are many different ways to professionally clean a carpet. Hot water extraction, bonnet cleaning, encapsulation, and more. 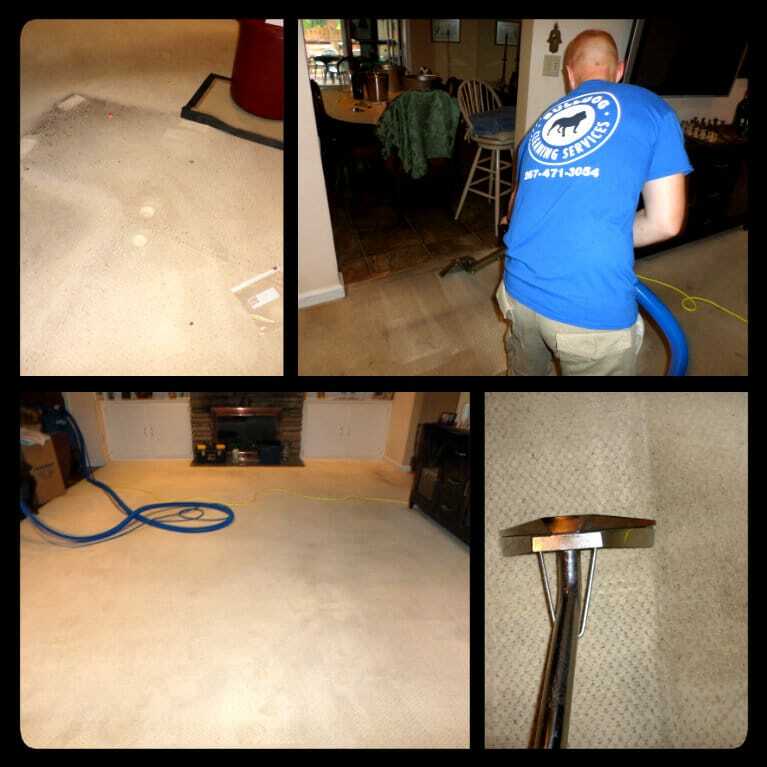 Below are a few different methods of carpet cleaning and a description of each. This method is widely used and considered the most common way to clean carpeting. A portable or truck mounted machine is used to heat up water, forceably expel the water under 100 - 1000psi of pressure and at the same time extract the water from the carpeting. Industry standard for dry time is between six (6) and eight (8) hours. 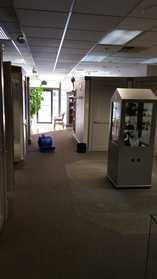 A chemical encapsulant is applied to the carpet and agitated. The encapsulant crystallizes around dirt molecule and is vacuumed up by the technician. Widely used in busy office buildings or businesses open 24 hours. Can be walked on immediately. 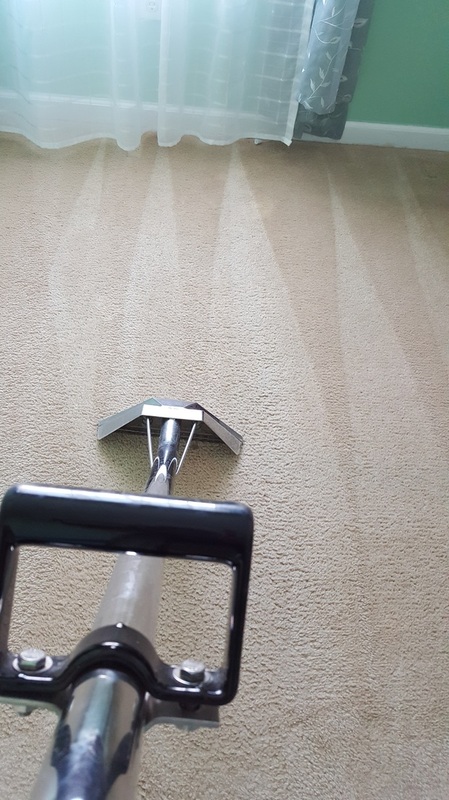 This is when a solution is applied to the floor and a rotary scrubbing machine is used in conjunction with a carpet safe pad (or bonnet) to clean the carpeting. This is used when you need a little more scrubbing power. Bulldog Cleaning & Restoration only uses this method in conjunction with hot water extraction.